I really miss Reeves & Mortimer's bizarre collaborations like the BBC show Shooting Stars, one of my favourite senseless shows. So it was with great joy and surprise when I heard about this new take of theirs on the sitcom. 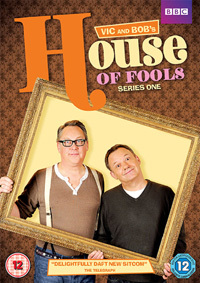 This farcical romp has Vic and Bob sharing a flat, the latter's son also living there, their obsessive neighbour (Julie) and eccentric friend (Beef) constantly popping in to add to the madness. Vic's dim brother Bosh (released from prison) also pulls in to squat with them. From having a ludicrous birthday party to taking part in a wig contest, the general tomfoolery is constant and relentless, the small bits of insanity injected into each story (and funny super-bad animation illustrating flashbacks) making for one hilarious collection of laughs. In the anarchic fashion of The Young Ones, this goes beyond Monty Python insanity and is a very particular humour not everyone may appreciate - sending things into a whole new dimension of craziness. The worst part of this however? A season from the BBC too often only consists of six episodes(!) - I could easily have laughed my way through a dozen of them. I can't wait for the second season!